As Brazil prepares to inaugurate Jair Bolsonaro as president, we the undersigned organizations wish to voice our deep concern regarding positions held by the president-elect that represent a serious threat to democracy, human rights and the environment. We also wish to reaffirm our support for the courageous individuals and groups in Brazil that strive to uphold constitutionally protected rights and freedoms in an increasingly challenging environment. President-elect Bolsonaro has frequently taken positions that are fundamentally at odds with democratic values. During the presidential campaign, he stated that if he lost he wouldn’t accept the election results. He has strongly defended Brazil’s brutal military dictatorship (1964-1985) and argued that it should have killed more people. Shortly before the second round of the presidential elections in October, he vowed to purge Brazil of left-wing activists, through either forced exile or imprisonment. In late October, he referred to members of grassroots movements like the Landless Workers Movement (MST by its initials in Portuguese) and the Movement of Homeless Workers (MTST), among others, as “terrorists”, generating concerns that Brazil’s controversial anti-terrorist law will be used to criminalize social activists. Chillingly, two MST leaders were assassinated by masked gunmen on December 8. Many fear that Bolsonaro’s hateful and threatening rhetoric is making Brazil – already the world leader in killings of land and environmental defenders – a much more dangerous place for activists. Bolsonaro’s hate speech has targeted numerous groups with long struggles against oppression and discrimination. He has said that descendants of Brazil’s runaway enslaved people (quilombolas) aren’t fit for procreation. He has said that if one of his sons were gay he would hope that they would die in an accident and that none of his sons would want a Black girlfriend because they are too well-educated. He has made deeply offensive comments about women, saying that he failed as a man when he had a daughter and telling a female lawmaker that she didn’t deserve to be raped by him. He has referred to migrants as “the scum of humanity” and opposed a law that grants basic rights to immigrants. Beyond these abhorrent verbal attacks, we are particularly concerned about a number of Bolsonaro’s policy proposals that, if implemented, can be expected to inflict far-reaching and lasting damage on Brazilian communities and on the environment. Bolsonaro has threatened to slash environmental safeguards on the Amazon’s protected forests while abolishing constitutional land rights over indigenous territories in order to enable the expansion of destructive agribusiness, logging and mining operations. These plans would inevitably provoke profound and irreversible environmental damage, destroy indigenous communities and cultures, and trigger violent land conflicts. They can also be expected to significantly hinder global efforts to fight climate change. 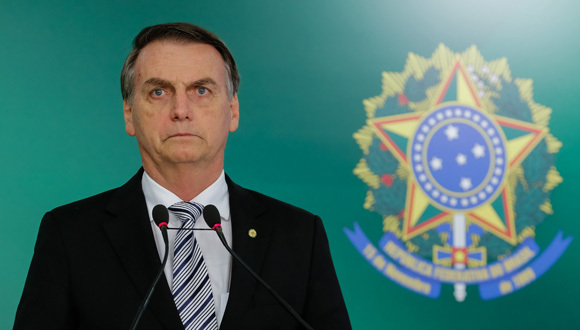 In response to increasing levels of violent crime, Bolsonaro has voiced support for extrajudicial killings by police in poor neighborhoods, which are already disproportionately experiencing the highest homicide rates ever recorded in the country. He has said that if a police officer “kills 10, 15 or 20 [criminal suspects] with 10 or 30 bullets each, he needs to get a medal and not be prosecuted.” He has said that criminals have “no human rights” and has indicated that he would expand militarization throughout Brazil in order to combat crime. On the institutional front, Bolsonaro has announced that his administration will eliminate the Ministry of Labor and the Ministry of Human Rights. These plans raise fears that the future government will seek to undermine efforts to protect workers' rights and other human rights. We are alarmed by these and other troubling positions adopted by Bolsonaro and his closest allies and will be closely monitoring the next administration's actions in the months ahead. We will speak out against hateful rhetoric and acts of violence, intimidation or persecution against the communities and civil society advocates that Bolsonaro has branded as “enemies" or "terrorists." We will expose the international enablers of Bolsonaro’s destructive agenda. And we will support those in Brazil who oppose authoritarianism and continue to defend democracy and the basic rights of all the country’s inhabitants.